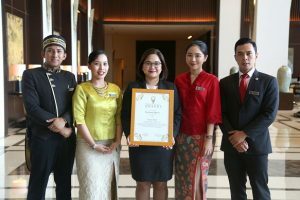 Completing the series of awards achieved within this year, Fairmont Jakarta recently won the World Luxury Hotel Awards 2018 and is granted the title of “Best Luxury Hotel in the Region”. The award gala ceremony was held in early November 2018 at Ayana Resort & Spa, Bali. 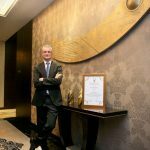 Established in 2006, World Luxury Hotel Awards is the pinnacle of achievement in the luxury hotel industry offering international recognition as voted by guests, travelers and industry players alike. Over 300,000 international travelers vote each year, during a four-week period to select the winners. Luxury hotels have the opportunity to participate in the World Luxury Hotel Awards by entering hotel categories that showcase their unique selling points and destinations. Nestled in the prestigious Senayan Square, Fairmont Jakarta provides luxurious convenience to its guests, offering 488 well-appointed guest rooms, suites and Sky Suites, 10 distinctive restaurants, bars and lounge as well as connectivity that brings the best of the city to your doorstep. The 108 units of Sky Suites, with options of one-bedroom or two-bedroom units, are equipped with facilities including a living room, full service kitchen and dining area that are convenient for extended stays. Fairmont Jakarta’s Sky Suites offer the best of both worlds – suite-style living in a five-star hotel with the comforts of home. The Presidential Suite at 303 square meters is the most luxurious suite in the city, equipped with an iPad control system, a large living room, dining room and a bar counter area, decorated with Balinese-style stone and wooden carving artwork as well as Venetian glass chandeliers. Its master bedroom features a one-of-a-kind painting by Indonesian legendary painter, Affandi. Its massive bathroom is equipped with a body-spray, rain shower and a Jacuzzi bath tub with a wall-mounted television. Additional features include a treatment and fitness room with a massage bed and TechnoGym treadmill equipment. The suite is also complemented with a study room as well as a full service kitchen with back service access that connects to the butler pantry. The design concept provides timeless sophistication, expansive space and tranquility with a flavor of Indonesia. The interior of the hotel combines international and Indonesian traditional elements. Contemporary works of art are blended with traditional batik in a way that combines influences from East and West reflecting the cultural diversity of Indonesia itself. The hotel has an extensive collection of artworks, ranging from sculptures, paintings, glassblowing arts, mural walls, reliefs, prints, pottery, jewelry and batiks of the royal court. Earlier this year, Fairmont Jakarta also won several awards from the 2018 International Hotel Awards and the 2018 World Travel Awards. 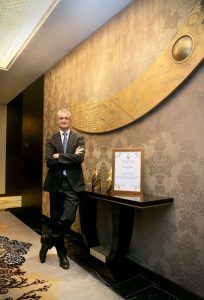 Three titles were granted from the International Hotel Awards – Best Luxury Hotel in Indonesia, Best Hotel Marketing in Indonesia and Best Hotel Marketing in Asia Pacific; and another set of three titles from the World Travel Awards – Indonesia’s Leading Hotel, Indonesia’s Leading Hotel Residences (Sky Suites), and Indonesia’s Leading Hotel Suite (Presidential Suite). For reservations and more information about the hotel, please contact (+62 21) 2970 3333 or reservations.jakarta@fairmont.com.